All from the X section (which happens to have the most questions by a reasonable margin, in case anyone was wondering). Q08: In Irregular Hunter X, what was the reason for changing the mark on VAVA’s forehead from a “Sigma” symbol to a “V”? Yoshikawa: Because he wasn’t working directly with Sigma, we decided to give VAVA his own personal “V” mark. I think that with that game, VAVA’s motives became much more distinct. Q09: Was the pink-haired female Operator in Irregular Hunter X a mass-produced model? I figured the blue-haired Operator girl must be because there were so many of them. Yoshikawa: The pink-haired female Operator is also a mass-produced model, but because we imagined her as a superior version, there are fewer of her type compared to the blue-haired model. Higurashi: We all make mistakes once in a while! We’re only human, after all. I’m a little surprised they both thought pink-hair seemed more scarce. I might need to rewatch the movie again, but I remember seeing far more of the pink girl (and multiples of her at once, no less) and the blue girl maybe only one time. It does suit Pinky to be some kind of more expensive supervisory model, since she did pretty much all of the talking, held the big meetings and communicated directly with the important characters like Sigma and X. I just didn’t get the impression that she was supposed to be rare at all. Seemed pretty obvious she wasn’t unique, although it would have been nice if they’d given one of her a name anyway. 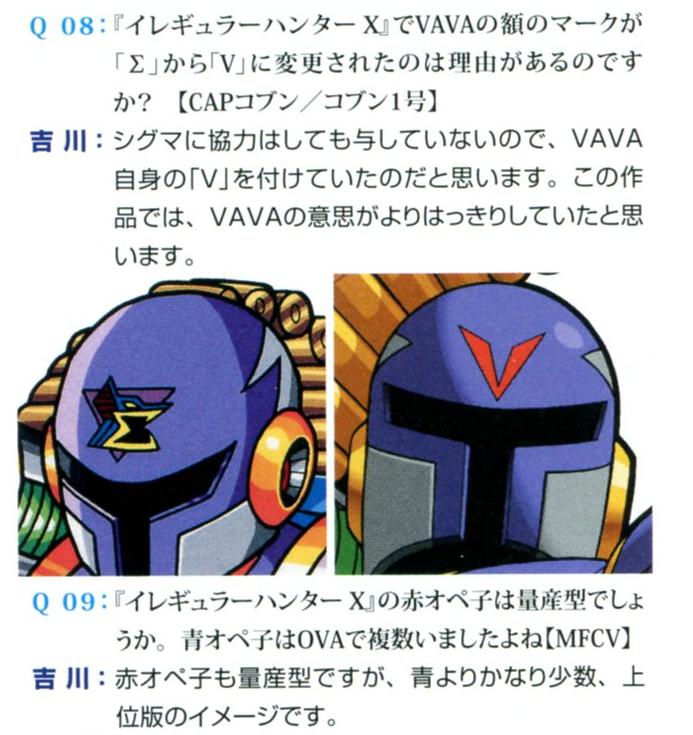 VAVA had his own unique symbol in every other game, so I wasn’t really wondering too much why they replaced his standard insigna with a red “V”… I’d probably rather know why his appearance in X8 was “VAVA V” instead of “VAVA III”. Actually, when it comes to Irregular Hunter X, there are a lot of other questions I probably would have asked before these. The biggest would have to be about Dr. Cain’s explosion scene. 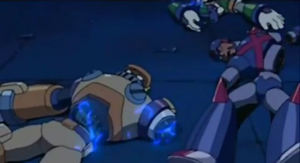 Or about what Sigma was trying to achieve by letting X live and power up before finally defeating him. Or if there was any particular reason why Zero didn’t try shooting Sigma when he was getting face-hugged. Or whether that officer repliroid had any relation to Signas as a previous model. Or Mannequin Seawater. What the heck is his deal? He strikes me as the old dog of the gang, the guy who’s seen everything more than once and done hard time in the clink back when it actually meant something. Always has a story to tell, “This reminds me of a job I did Megalopolis one time…” Throw in a couple speeches about criminals these days are just a bunch of young punks running wild, and a “Pain? Sonny Jim, you don’t know the meaning of the word!” and there you have how I picture his guy. Next time on The Answer, we’ll tackle a few more X series questions. Or are you guys sick of these? I could switch it up to some Zero or something. Say when. 12 Comments to "The Lady, the Scoundrel, and the Gun"
If I may ask, do these questions from the art book focus on all of the sub series (Classic, X, Zero, Legends, etc. ), or is it just limited to the most well known branches? ’cause ever since scans of the development artwork for Legends 3 had popped up on the internet, I’m curious to know if there was a Q & A session for the Legends series, in addition to the EXE series. 6 Classic Rockman, 14 Rockman X, 5 Rockman DASH, 11 Rockman EXE, 6 Zero/ZX/ZXA (lumped into one column), 2 Ryusei, 2 xOver, and then 10 “everything else” which includes stuff like fighting game appearances, mobile games, and questions asked directly to the illustrators rather than about any series in particular. That’s in addition to 11 pages of interviews that Ariga conducted with Yoshikawa, Suetsugu, Ishikawa, Higurashi and some newer lesser-known Rockman artists, which cover a wide range of subjects not at all limited to just Rockman & Rockman X, or even just Rockman at all. So while there definitely is some, there is not a whole lot nor is there a lot of particularly earth-shattering information about DASH, I’m afraid. I’m rather curious about the Zero/ZX column, I’ll admit. I was thinking I’d finish up with X Command Mission and use that as a segue into Zero, but if y’all want more Zero series now, then Zero you shall receive! I rather like that idea. I’d kind of prefer chronological like that. If I could ask the Capcom officials, I’d ask what the deal was with Roll’s battle armor from the beginning of the third “Upon a Star” episode. 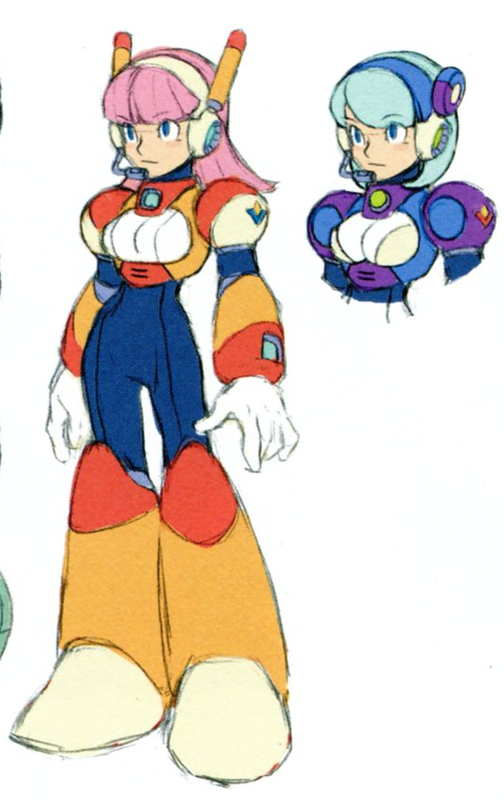 Was it a throwback to the initial plan to include her as playable in Rockman 2? And why was she suddenly back in her usual dress when she’s pulled out of the game? Since Upon A Star was made in the early 90s, I’m not sure how many of the group would have been there to remember. Probably would have been another of their “Dunno! Maybe?” answers. 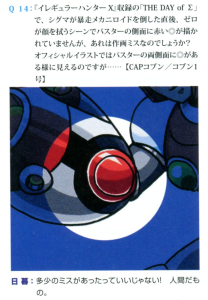 For Roll appearing in Rockman 2, I did search around a bit in the past to find the source for that tidbit, but I couldn’t confirm it. I’ve read on the Wikis where it pops up that it’s a 1999 interview with Inafune, but it doesn’t give a publication or even a language so it’s been elusive to track down and verify. It may not be legit. I would like to know more about that as well! So… instead of bringing up the visual similarities between the Z-Buster and the first X-Buster upgrade, this one fellow asks about an animation error? Really? Personally, I always preferred the Blue bob cut operator. but thats just me. I like bob cuts, and blue hair seals the deal. seems more unique than pinkie, who looks more like layer.